Who does not love fries! Fun to eat, always good and goes with everything. Well I wanted to come up with a healthy paleo version and I was very happy with the result. Slice the carrot in half the long ways and then into quarts. Carefully slice each piece again into long fry like strips. Place in a big bowl and spray well will cooking spray or oil. Toss with salt. 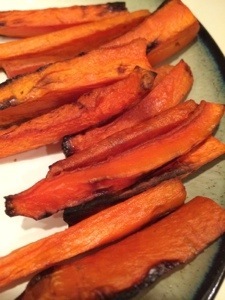 Lay carrots on a large foiled cookie sheet. Bake at 500 degrees for about 20 – 25 minutes until golden.